Smell can usually transport us to certain memories. This class, facilitated by your hypnotherapist Kemila Zsange, and aromatherapist Sue Pearson, is designed to guide you towards wellness by following your nose! Essential oils have power to shift and process emotions. Combined with powerful hypnosis you will let go of those emotions you no longer need and shift into emotions you prefer. In this open, safe and fun class, you will journey through emotions with comfort, support and care, so that you feel connected, focused and uplifted. This class will help you soothe your senses, process your emotions and shift your states. You will be able to transform pain to consolation, overwhelm to serenity, confusion to clarity, stress to peace, resentment to forgiveness. We will close with a supercharged hypnotic forest walk. One after another, you’ll experience the textures, sounds and scents of the forest, so that you feel restored, grounded, supported and inspired. One session only. You will receive a sample of Abundance blend of essential oil. Some people call her Psychic Medium. She calls herself Your Soul Messenger. Out of all the people that I know, Orlea Rollins is one of the gentlest beings with the most strength. A warrior spirit, Orlea is gifted with openness and clear channel. A psychic reading circle with Orlea is very gentle yet powerful. I have had my own readings with her, and I found it insightful, informative and validating. I am excited to introduce Orlea and her intuitive readings to more people who feel moved. Come join Orlea and Kemila for an intimate Psychic Reading Circle. First Kemila will guide a group hypnotic centering and mind-body relaxation, so that you enter into a more receptive and meditative state. Archangels and your guides will come to gently surround you with love. Depending on your agenda and the agenda of your higher self, Orlea will work with your Spirit guides, Guardian Angels, pets and loved ones who have crossed over, uncovering information, answering burning questions, and laying out options for your path, so that you are more empowered to be your most authentic, talented, aligned self. In the security of the circle, you will feel seen at the most profound level. If you feel lost or stuck at this moment; as if nothing is moving forward – or not even knowing which direction to go in order to move forward, Orlea’s reading might be exactly what’s needed for you at this time. All three reading circles were full in 2015, and so far we have only planned one reading circle in 2016. Orlea currently lives and works in Whitehorse, Yukon therefore this is a rare opportunity to have an intimate psychic reading circle with Orlea. Again in 2016, Kemila will take the stage and present, on behalf of Association of Registered Clinical Hypnotherapists, at the Wellness Show on the topic of Your Wellness with Hypnotherapy. She will also be at ARCH booth #910 on Friday morning and Sunday afternoon, in Vancouver Convention Centre, East Building Exhibit Hall B & C, 999 Canada Place Vancouver BC, along with other hypnotherapists, answering questions, offering tips, conducting mini-relaxations. Below is a video from 2012 Wellness Show. The hypnotist in pink shirt is Kemila, who appears for three seconds in the video at 1:30, hypnotizing two people in the din of Canada Place. Meet Kemila at this exciting in-store event! Kemila Zsange, RCCH will be one of the featured speakers at ARCH (Association of Registered Clinical Counselling Hypnotherapists) annual conference hosted at Best Western Chateau Granville (1100 Granville St. Vancouver, BC), May 23 & 24 – 2015. Kemila’s two and half an hour long workshop will open the conference on Saturday morning. The weekend conference itself is fully packed with wonderful presentations to augment one’s hypnotherapy practice. Find more details including speakers, topics, and lunch menus. Although this is an ARCH Canada production, it is an Open Conference to all Canadian Hypnotherapists or those interested in hypnotherapy. Limited seating available. Register today. 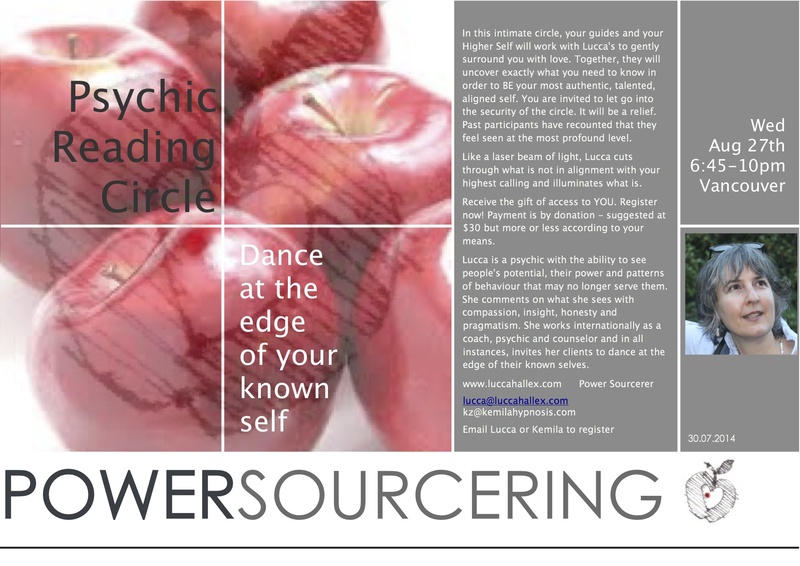 Lucca’s psychic reading circle is gentle yet powerful. Since I have experienced first hand her work in action (See my latest blog post where Lucca was mentioned), I am excited to introduce Lucca and her professional and intuitive readings to more people who feel moved. In this intimate circle, first I’ll guide a hypnotic group centering and relaxation. Your guides and your Higher Self will come and work with Lucca’s to gently surround you with love. Together, they will uncover exactly what you need to know in order to BE your most authentic, talented, aligned self. You are invited to let go into the security of the circle. It will be a relief. Past participants have recounted that they feel seen at the most profound level. Like a laser beam of light, Lucca cuts through what is not in alignment with your highest calling and illuminates what is. If you feel lost or stuck at this moment; as if nothing is moving forward – or not even knowing which direction to go in order to move forward, Lucca’s reading might be exactly what’s needed for you at this time. Let her echo your life purpose so you find ways to release and to move ahead with ease and certainty. If you want to be more in touch with the depth of yourself, you will receive the gift of access to YOU with Lucca. When: 6:45pm – 10:00pm, Wednesday, August 27, 2014. Payment for the three-hour circle is by donation – suggested at $30, but more or less according to your means. Lucca is a psychic with the ability to see people’s potential, their power and patterns of behaviour that may no longer serve them. She comments on what she sees with compassion, insight, honesty and pragmatism. She works internationally as a coach, psychic and counselor and in all instances, invites her clients to dance at the edge of their known selves. For more visit: www.luccahallex.com. Kemila Zsange, RCCH will be one of the featured speakers at ARCH (Association of Registered Clinical Counselling Hypnotherapists) annual conference hosted at Best Western Chateau Granville (1100 Granville St. Vancouver, BC), June 20, 21 & 22 – 2014. 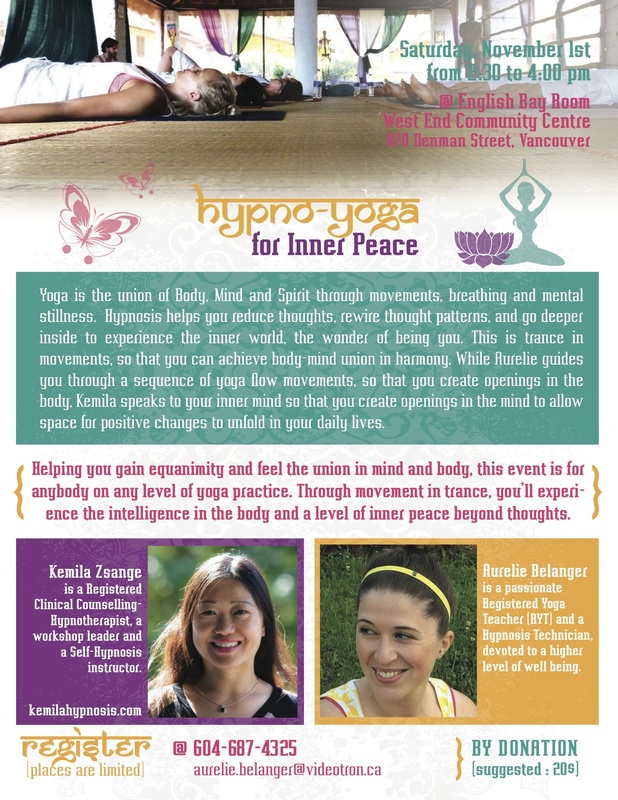 Kemila’s workshop in Burrard Room, 10:30am – 1:00pm on Saturday June 21, is the attendees’ top choice, and the weekend conference itself is fully packed with wonderful presentations to augment one’s hypnotherapy practice. Although this is an ARCH Canada production, it is an Open Conference to all Canadian Hypnotherapists or those interested in hypnotherapy. Click here to see conference agenda and details of speakers. Limited seating available, register now. September 9th (Monday) is Health & Fitness Day at BCIT Great Hall Orientation week. Kemila Zsange will be there offering hypnosis demo, conducting mini-relaxation, offering services and products including Hypnosis CDs and interacting with new and old returning students. Kemila Zsange Hypnotherapy & Counselling is getting very outdoor this beautiful summer. I was at Strawberry Festival before, but only to have their very extraordinary Strawberry Shortcakes – so fresh, luscious and generous in serving! And this year, I’ll be there for longer time, with a table and a recliner. I’ll be offering complimentary doses of personalized Vitamin H – That is, Hypnosis for relaxation, mental focus, and whatever you bring to the table. The festival admission is free. Come for the vitamin H, and also music, magic, Strawberry Lemonade, Bazaar, card reading, chair massage, BBQ… Visit the festival website for more details. A dear friend of mine, fellow hypnotherapist Cori J. has put up this event. We all know too well what a Pity Party feels like. Now it’s time for a Positivity Party, by expressing gratitude in a conscious and fun way. “I don’t think there is any better way to show your gratitude than to share joy with other people.” Cori Says. I set my recliner right there in the centre of Main Street, offering complimentary onsite mini-hypno journey where people can FEEL and EMBODY gratitude. It’s about relaxation, breathing, awareness and allowing. Even a mini-session can be powerful! A NEW CHAPTER in your book of life!! Changes in career, relationships, finances… overwhelming you? Are you feeling stuck? Not sure how to take the next step? Is your mind in the way of your heart? Learn to build more confidence to create the change you need and face the changes life gives, and more, with Gillian Needs & Kemila Zsange!! Imagine having not only one but two experts on the subconscious mind take you simultaneously into trance where you realign your conscious desires with your subconscious motivations, so that you KNOW from your own being that not only can change be easy, but you can also enjoy the journey. Join us April 23, 2013, at 7pm for Clarity of Mind, with Hypnosis we can help you re-focus and turn the page in the New Chapter of your Life!! Utopia Gifts, 1826 Lonsdale Ave. North Vancouver. For $35, you can change your thinking and change your life! Date: Saturday, November 24, 2012, 2:00PM to 4:00PM. This session will combine the modalities of hypnosis and reiki healing energies to clear and heal your limiting beliefs about money and to attract to you a more expansive and gratifying relationship with money. Sue Pearson, Registered Usui Reiki Master (CRA-RP) will create and seal a sacred space infused with healing reiki energies and supported by crystals known for their clearing properties. Kemila Zsange, registered clinical hypnotherapist, will walk us through a centering exercise and help us to identify common limiting beliefs related to money, through a light trance state. As well, each participant will set a positive intentions for the session related to money. During this time, Sue will send reiki energy to the space and all of you in it. She may be called to work on individuals (Sue does hands on or hands off, it’s your choice) as a way to support the group’s intentions. Sue often receives intuitive guidance in the sessions and will share her insights and impressions with the group after the session. Sue is a wonderful Reiki healer and a session with her is absolutely heavenly. For people who like to measure effectiveness of such treatments, we will be comparing the strength of our limitations and goals before and after the event. – Loosen up our tension and stress on this topic. – Remove blocks as we let go of the beliefs that are not serving us for a joyous life. – Stimulate creative flow of money. – Transform negative associations with money into positive ones. Participants will enter a draw to win one of Kemila’s Hypnosis CDs. RSVP required at Meetup Experiencing Hypnosis Group. For more information on Sue and her work, please visit her website. The Akashic Records is your record of the soul, feelings, past and present life. It is also know by some as the universal Book of Life. There are many books written that describe what are Akashic Records and how to access them. One book describes Akashic Records to be “dimention of consciousness”. So what entails is that Akashic Records is an unforeseen dimension. 6 people were an good number for group reading. A session with Christine Johel is very powerful yet gentle. Her kind heart and sweet demeanor are balm to the mind and soul, yet she is quick to identify opportunities and blocks so that one can live more of the life that is wanted. She understands all energies. I recently had a session with her, in an early Wednesday afternoon, underneath a bridge by Fraser River. My tears flew at the same rythm as the quiet river when she started to read and deep deep inside me resonated so profoundly, a dimension of me that I didn’t even notice was opened. I did the group centering work. Christine gave us group reading, as well as individual readings. Nuts and apples were provided for grounding. And we had a winner for private reading with Christine. Congratulations Mike! When: 2 – 4pm, Saturday September 8, 2012. They say there is no separation between mind and body, and mind body are closely connected; therefore our body is not a mechanism like a car. When there’s a problem, we let doctor “fix” it, using drugs and knife. In fact, we can use our mind to participate and have a greater say about our health and well being. There has been scientific documentation using hypnosis for pain control. But on July 25, 2012 late afternoon, we shared how to take advantage of mind-body connection, learned how to use self-hypnosis to get in touch with our inner well being, and had a group session to strengthen immune system and accelerate healing. A lot of sharing, Q & A, experiencing, and FUN. We will then use imagery to embrace abundance. This event is free, but any amount of donation will be accepted and appreciated. You must RSVP to attend this event. Join our Meet up group and RSVP. Come for a free mini relaxation session with me in YMCA Vancouver Small Business Showcase annual event. There is a private room (CIBC Centre for Reflection) with chairs and a recliner set up in the Atrium of beautiful new YMCA. In addition, you will receive tips for self-hypnosis of stress reduction for busy people.